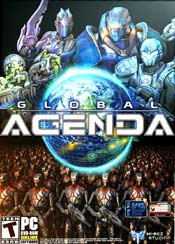 Global Agenda is a fast-paced action MMO using Unreal Engine 3 set in Earth's near future, a spy-fi world of advanced technology and player-driven conflict. The players control the world of Global Agenda, forging alliances with their peers and executing lightning strikes against their enemies. They determine which factions to aid and which to oppose, while the only thing that stands in their way is other agencies. * Develop your agent - Create, extensively customize, and improve your agent character over the course of your career, complimenting your FPS skills with RPG-style progression and high-tech gear. * Advance your agency - Join a player-created agency, compete in technology races for advanced equipment, and capture critical locations to increase your influence in the world. * Compete in fast-paced PvP combat - Work with your allies to gather reconnaissance data, then raid or capture enemy-controlled facilities during objective-based missions. 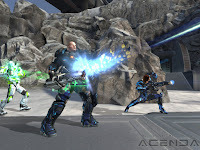 Equip yourself from a powerful array of weapons, armor, and strategic devices like triggered explosives, deployable turrets, stealth suits, holographic decoys, and remote control robots. * Experience a dynamic, player-driven world - Agency leaders navigate through a global conflict of other player-run groups, striving to reach their goals first. Territory, resources, technology, and influence are all valuable commodities, with agencies engaging in politics, intrigue, and outright deception to control them. And yet another high profile MMO is going free-to-play. Hi-Rez Studios announced that their shooter Global Agenda will feature a free-to-play option starting mid-April. A forum post by a Hi-Rez Studios team member shows the Global Agenda plans for the next months. They plan to release significant features before the end of March. Global Agenda, the team-based shooter-MMO from independent developer Hi-Rez Studios, launches today. Hi-Rez Studios debut title has been in development since 2005. Hi-Rez Studios released the Global Agenda launch trailer, a perfect timing to remind players that their futuristic MMO shooter is set to release on February 1st. There's a new giveaway running, thanks to Hi-Rez Studios, the folks behind MMO shooter Global Agenda - the one with the "No Elves" trailer, remember? We already knew the pricing details for Global Agenda, but we were still left wondering when this "no elves" MMO shooter would be released.